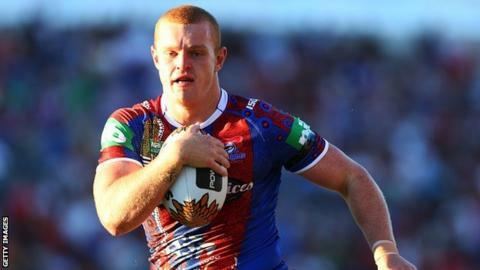 Newcastle Knights forward Alex McKinnon, who suffered a broken neck during a game last month, has been offered a job for life by the National Rugby League. The 23-year-old's playing deal was due to expire on 31 October. The Knights have extended that contract and the NRL offer will take effect at the end of the Knights deal. "To now have my future secured by the game is really humbling," said McKinnon. "As I have said before, I am completely overwhelmed by all of the support I have received." The Knights and McKinnon were in the middle of finalising a contract extension prior to his injury. Chief executive Matt Gidley said the Knights would honour their contract offer, with McKinnon guaranteed employment at the club. "Alex is a wonderful talent on the field and a better clubman off the field," Gidley said. "While we remain hopeful Alex will make a full recovery, we are pleased to extend his contract at the Newcastle Knights because there is no doubt he'll be a valuable employee."